There’s more to books about food than just recipes. They can touch on the histories of culture, travel and more from around the world. Our collections reflect this diversity. 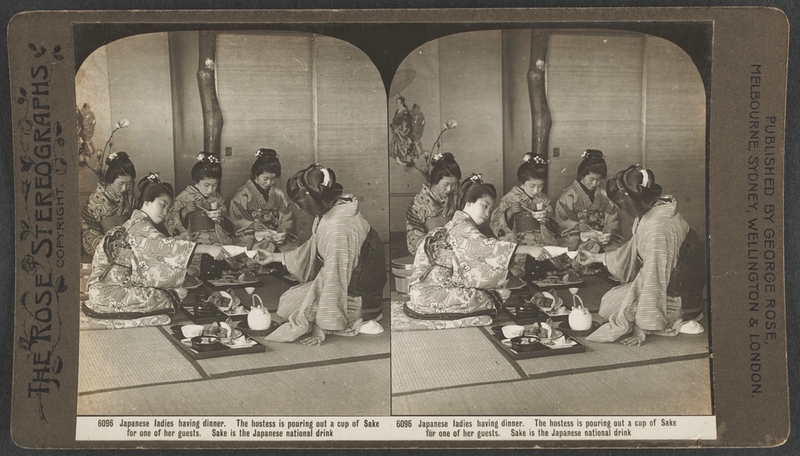 Japanese ladies having dinner, George Rose, ca. 1890–1900. They include books on edible plants and animal resources as they existed all over the world. They look at how cuisines evolved and ‘travelled’ across the world as explorers and adventurers travelled far and wide, bringing back with them foods and flavourings from their journeys. The ancient trade route known as “the Silk Road” is one such example which carried/brought so many aspects of life and living across from the Far East through to Italy and then the rest of Europe. The Library’s resources, both print and non-print, cover aspects of this culture – including food culture and the plants or animals consumed in a range of different combinations across countries. We also have a range of resources of foods on health and nutrition, as well as cookery for people with various allergies or health conditions. The Library’s resources – many not on display – also include books by renowned Australian chefs and restaurateurs and, in some cases, their papers in our Manuscripts collection. There are copies of menus from restaurants in our Pictures Collection – quite a few of the images are digitised and viewable online. 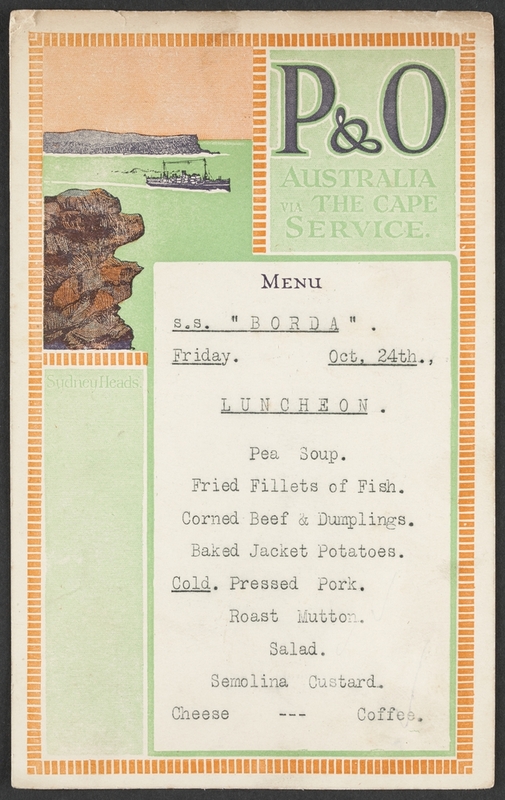 S. S. Borda – menu, Peninsular and Oriental Steam Navigation Company, ca. 1920–1930. We also have an excellent research guide to Food in Victoria, which will help interested persons search more fully the breadth and depth of our collections on this subject. In addition to the above link the Library’s website has interviews with famous chefs as well as images from our collections. Visit this fabulous Gusto microsite for more.